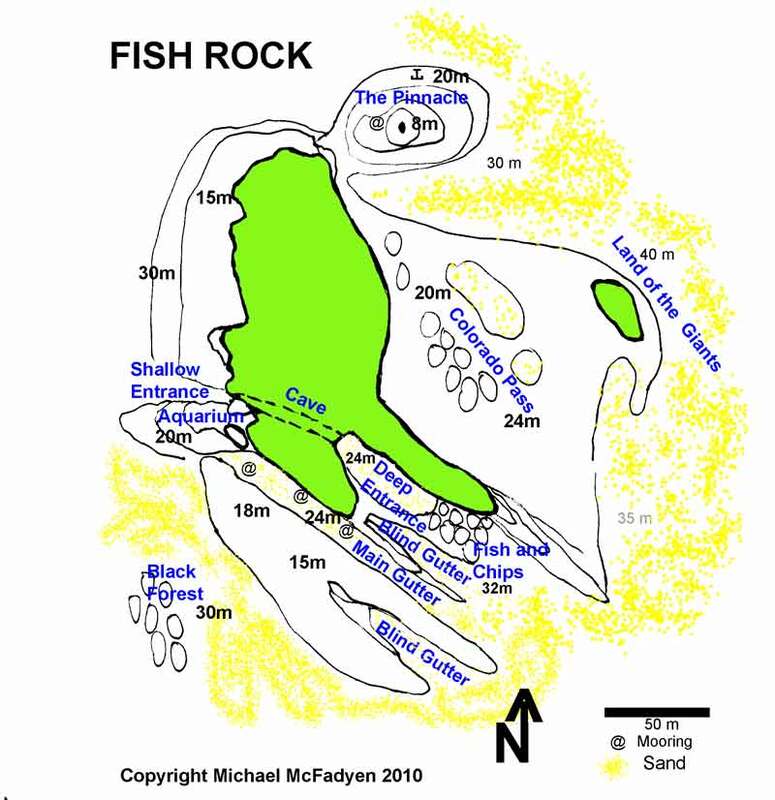 Michael McFadyen's Scuba Diving - Fish Rock Deep Entrance Fish Rock is, of course, famous for its cave. 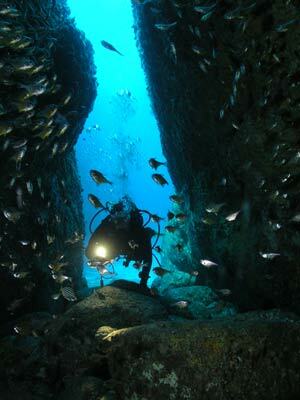 Nearly every one who comes here wants to dive Fish Rock Cave. The cave is actually a tunnel, in that it goes all the way through Fish Rock. The cave is about 120 metres long and runs roughly east to west. The eastern end is the shallow entrance and where most divers are taken, at least on their first dives here. This is primarily because it is much shallower at about 10 metres, although you have to go to about 17 to 20 to get there from the moorings. A lot of dives to the cave go in and out via the shallow entrance. The eastern end is much deeper, being around 25 metres. 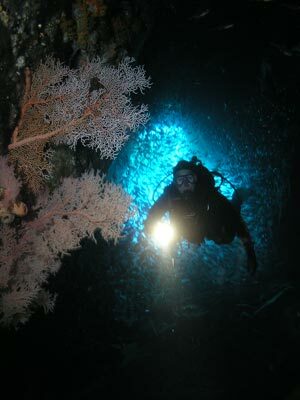 It is a much more interesting dive to do a full circle and go in the deep entrance and come out the shallow entrance. This article describes that dive. I normally do this as a second dive after a deeper one at a site like The Pinnacle or a drift from that location via The Land of the Giants or the Shark Gutters. From the mooring (all of which, no matter ths shop you use, are located in the main shark gutter), you descend to the level of the ridge to the south. If you look into this gutter you will see that there are some very large black coral trees on the northern wall of the gutter. Swim at this depth (20 to 22 metres) to the south-west along the gutter till you have the ridge on your left drop down to your depth. There can be a lot of ladder-finned pomfret and yellowtail in this area and, of course, grey nurse sharks in the gutter. Cross over the ridge and you will see another sand gutter here that comes to an end a bit to your left. There can also be grey nurse sharks in this gutter. Continue over this gutter to the next ridge. If you turn left here you will cross into the main gutter that leads to the deep entrance. This is about 20 metres across here and has a sandy bottom. However, I normally head out to Fish and Chips for a bit before coming back into the gutter. Read that article if you want to do it this way. At the eastern end of the deep entrance gutter there are some large boulders. Around these there are normally heaps of fish and normally many wobbegongs. Sometimes you can be totally consumed by fish, mostly yellowtail and ladder-finned pomfret. I have only ever seen this density of fish on the wreck of the SS Tuggerah (at 46 metres). At times you cannot see each other even though you are metres apart. When this happens, it makes a brilliant dive! If you are arriving at this spot after going to Fish and Chips, you will need to move fairly quickly sa your bottom time will be getting low. Swim along the gutter towards the deep entrance and you may see some more wobbegongs and perhaps a turtle. 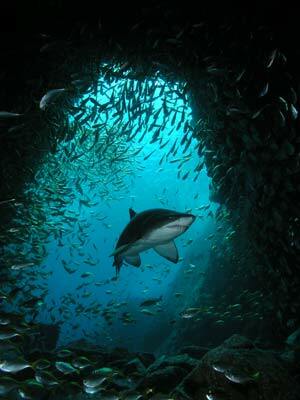 The one thing that you are almost certain to see is a grey nurse shark. On dives here I have seen as many as 15 sharks in this gutter. 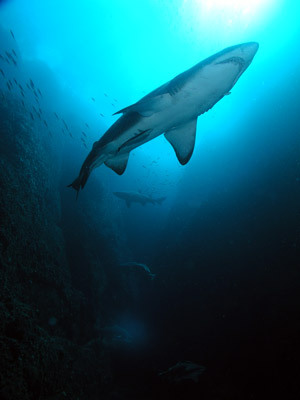 In September 2007 I saw about eight just in the 10 metres outside the Deep Entrance. The Deep Entrance to the cave is quite small, angled over at about 10 degrees to the right. As you enter, you will normally find that there are lots of pomfret in the mouth. Once you move inside it gets dark and soon you will need a torch to see anything. Take care as there are often wobbegongs here and nearly always a huge bullray. The cave runs straight for about 15 to 20 metres before apparently coming to a dead end. However, there are two chimneys that give access to the main section of the cave. The first chimney is a bit tighter than the second one, but it can easily be traversed. Use this one if the bullray is between here and the second chimney. The second chimney is much larger and easier to swim up. As you ascend, look for the small sea cucumbers that are all over the walls of the cave. Be careful not to touch them as they extrude a gooey substance that will stick to your wetsuit and gloves and is very hard to get off. 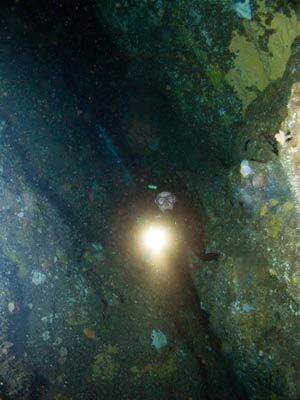 Once in the main part of the cave, swim towards the darkened end. You will be able to see light from the eastern end as there is a very narrow exit out here (but I am pretty certain that you cannot exit out there). As you swim along the cave, look for more wobbegongs on the cave's floor. 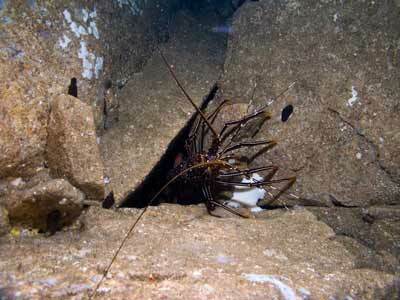 You will also see hundreds of painted crayfish, some huge. These are all over the place, under boulers, in cracks and on the walls. After 10 minutes in the cave you will see light ahead. This is the Shallow Entrance. If you go to the top of the cave you will see that there are a couple of air pockets and you can go there if you like. While in the air pockets you may have the air fog up on you. This is caused by a wave entering the cave and pressurising the air pocket, causing the moisture in the air to come out as a fog. As soon as the wave passes, the fog clears. 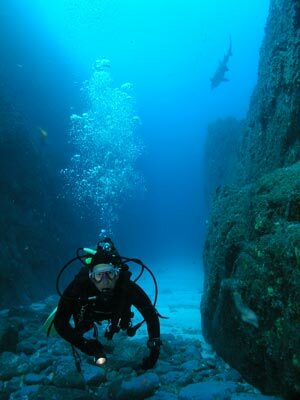 It is perfectly safe to breath this air as it is replenished daily by divers. As you approach the Shallow Entrance you will see some small and large gorgonias. 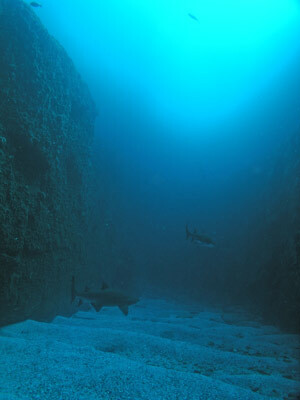 The actually entrance will normally be filled with ladder-finned pomfrets and there may even be a grey nurse shark or two cruising in and out of the entrance. All these can combine to give you excellent opportunities to get some great photographs. After exiting the cave, swim along the gutter in front of you. This has a lot of small rocks at first and further on as it drops, thousands of pebbles. As it drops further, it becomes sand. If you are short on air or bottom time, cross over the ridge to your left at about 15 metres or so. If there is a current from the north (as there often is), you will need to take care. Stay at about 15 metres or so and drift to the south. Keep within site of the wall at left and once you come to a shear wall, this is the start of the main shark gutter where the moorings are located. Swim along the gutter (on the ridge to the south if you need to be shallow). Once back at your boat, do your safety stop on the wall to the north of the gutter.